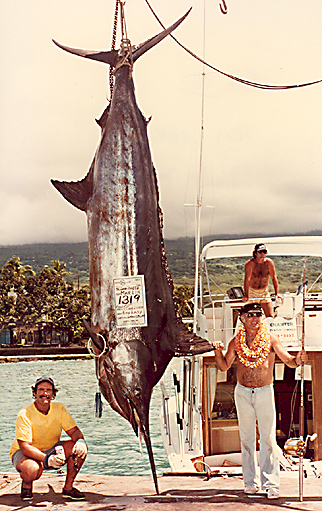 This was the largest blue marlin caught in 1980. The fish attacked a Jim Unger Lollipop lure on 80-lb test line trolled behind the 42-foot Uniflite FOXY LADY under the command of Capt. Tom Salisbury. Crewman Greg Lima handled the leadering duties after the fish fought for an hour. Surprisingly, the marlin had an 80-lb tuna in its throat when brought to the boat.